Happy National Donut Day! Today marks the SIXTH National Donut Day I’ve celebrated here in my little on-line home. Even though so much has changed with how I eat, I still celebrate the High Holy Day of the Donut Kingdom. 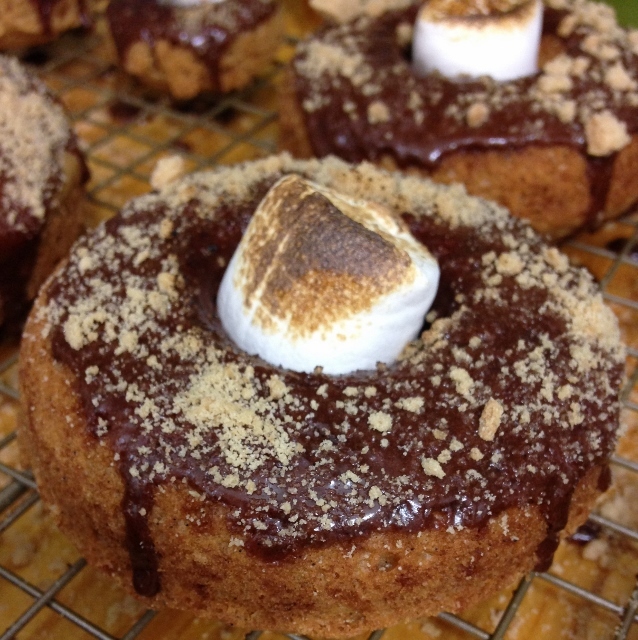 This year I’m celebrating with S’mores Donuts. If you haven’t been following me since back in the stone age of my blog, I want to catch you up to speed. I started blogging about donuts. 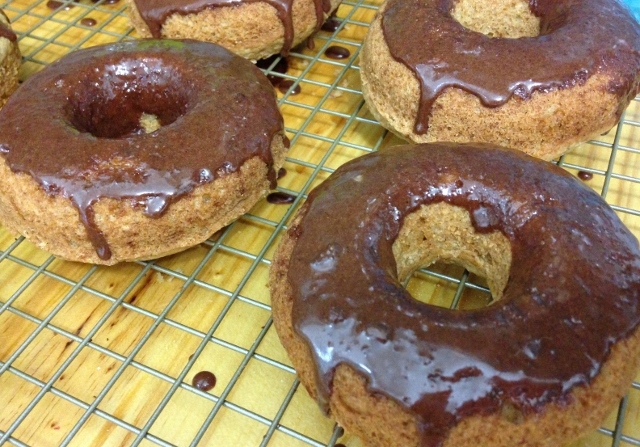 Not gluten-free donuts, not even healthy donuts, just donuts. My plan was to visit 52 different donut shops in a year, eating one donut a week as part of my weight loss plan. You know, keeping it real by eating only one sweet treat each week. Midway through the year, gluten had to go in order for me to find my way to health. I got pretty darned sick focused on losing weight instead of focusing on my health. But donuts didn’t leave, just the gluten part. And even though I’ve made a switch to a way of eating that is healthier for me than what I ate back in those days, I still enjoy a good donut. 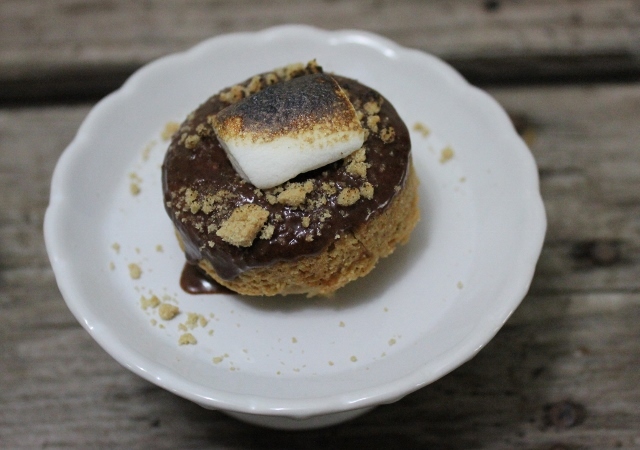 Today I made S’mores Donuts. I started with this recipe from Free Range Cookies. 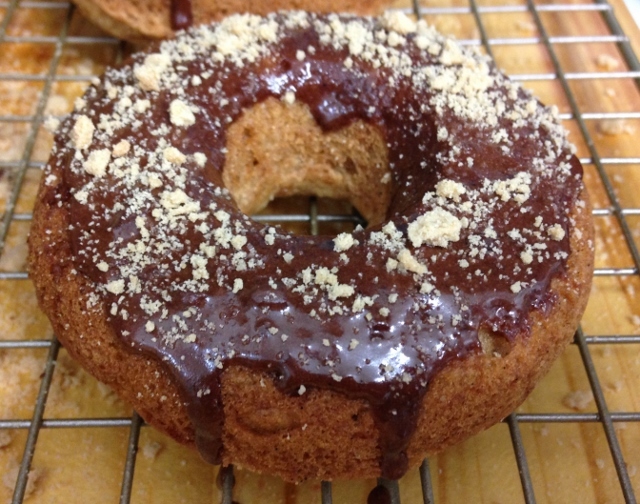 It’s the best darned cake donut recipe I’ve ever baked at home. I also made her chocolate glaze. 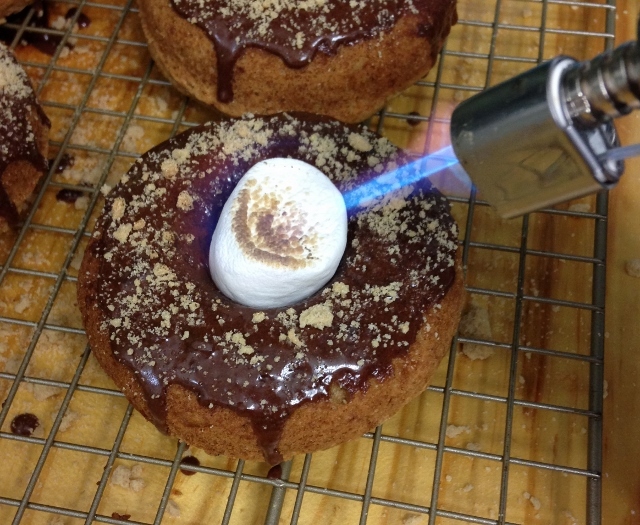 Then I sprinkled on some gluten-free “graham” cracker crumbs, stuck a Dandies marshmallow in the donut hole and toasted it. So good! 1. I used my favorite gluten-free flour blend. 2. 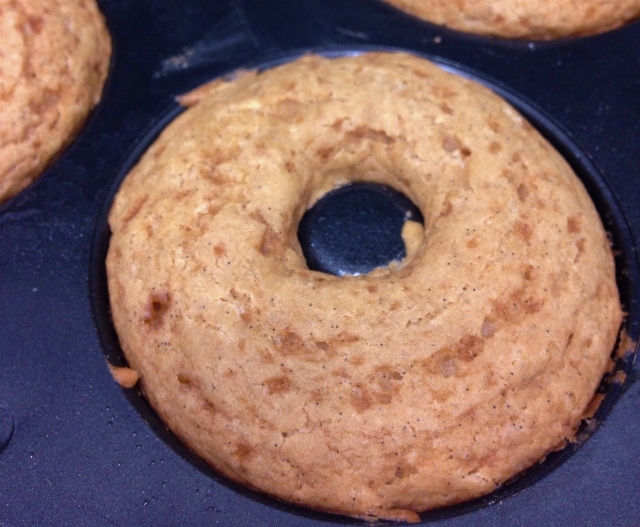 I used coconut sugar instead of refined white sugar. 3. I used Earth Balance vegan butter-y sticks for the shortening. 5. I used vanilla bean paste instead of extract. 6. For the glaze I used maple syrup instead of corn syrup. I used Kinnikinnick “graham” style crackers, but also really like the ones from Schar. I used Dandies marshmallows, which are vegan. I had their regular size, which are perfect for a large donut. If making mini donuts, the small Dandies would work perfectly, but they aren’t available in my local grocery store yet so I cut the regular ones into thirds. Second, dip them in the chocolate glaze. Third, sprinkle with “graham” cracker crumbs. Fourth, stick a marshmallow in the hole and toast it. I use this kitchen torch. This post contains affiliate links. Should you make a purchase following a link in my post, I may make a small commission. 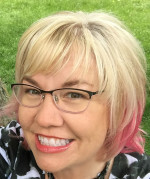 Your price is the same AND you’re supporting me in my efforts to share original recipes tested in my kitchen, links to recipes I enjoy and other information that may be beneficial to you, all at no charge. I appreciate your support! I wish I could of celebrated this day with you! You and I have two loves- donuts and Kansas City!